Scrosati, R.A., M.J. Freeman & J.A. Ellrich 2019. Rocky intertidal community structure and benthic-pelagic coupling in wave-exposed environments along the Nova Scotia coast. Atlantic Canada Coastal and Estuarine Science Society (ACCESS) annual congress (Halifax, NS, Canada), upcoming. Freeman, M.J. & R.A. Scrosati 2019. Density of intertidal barnacles along their full elevational range of distribution conforms to the abundant-centre hypothesis. 17th St. Francis Xavier University Research Day (Antigonish, NS, Canada). Meunier, Z.D., R.A. Scrosati, J.A. Ellrich, S.D. Hacker & B.A. Menge 2018. Cross-continent comparison of coastal cooling events in Oregon and Nova Scotia. 99th Annual Meeting of the Western Society of Naturalists (Tacoma, WA, USA). Ellrich, J.A., S.M. Ehlers, R.A. Scrosati & M. Molis 2018. Nonconsumptive predator effects on prey demography: field experimental evidence. 53rd European Marine Biology Symposium (Ostend, Belgium). Catalán, A., N. Valdivia & R. Scrosati 2018. Interhemispheric consistency of scale-dependent spatial variation in the structure of intertidal rocky-shore communities. 4th World Conference on Marine Biodiversity (Montreal, QC, Canada). Wei, C.L., M. Cusson, P. Archambault, R. Belley, M. Bourque, T. Brown, B.J. Burd, E. Edinger, E. Kenchington, K. Gilkinson, J. Lemieux, M. Lévesque, H. Link, A. Piot, P.A. Ramey-Balci, R.A. Scrosati, A. Séguin & P.V.R. Snelgrove 2018. Canada's three oceans of seafloor biodiversity: patterns, hotspots, and potential drivers. 4th World Conference on Marine Biodiversity (Montreal, QC, Canada). Ehlers, S.M., J.A. Ellrich & R.A. Scrosati 2017. Nonconsumptive limitation of mussel recruitment by predatory snails. Atlantic Canada Coastal and Estuarine Science Society (ACCESS) annual congress (Montreal, QC, Canada). Ellrich, J.A., Z.T. Sherker & R.A. Scrosati 2017. Predator-induced shell plasticity in mussels hinders predation by drilling snails. Atlantic Canada Coastal and Estuarine Science Society (ACCESS) annual congress (Montreal, QC, Canada). Sherker, Z.T., J.A. Ellrich & R.A. Scrosati 2017. Predator-induced shell plasticity in mussels hinders predation by drilling snails. Science Atlantic Biology Conference (Antigonish, NS, Canada). Ehlers, S.M., J.A. Ellrich & R.A. Scrosati 2017. Nonconsumptive limitation of mussel recruitment by predatory snails. 15th St. Francis Xavier University Research Day (Antigonish, NS, Canada). Ellrich, J.A. & R.A. Scrosati 2016. Flushing away the stink of predators: the modulation of predator chemical cues by water motion. 14th St. Francis Xavier University Research Day (Antigonish, NS, Canada). Scrosati, R.A. 2015. Environmental and biological determinants of intertidal community structure along the Atlantic coast of Nova Scotia. Gulf Aquarium and Marine Station Cooperative Annual Fishermen's Forum (Antigonish, NS, Canada). Scrosati, R.A. & W. Petzold 2015. Pelagic food supply and drift sea ice influence intertidal community structure along the Atlantic Canadian coast. 100th Congress of the Ecological Society of America (Baltimore, MD, USA). Joseph, L., M. Cusson & R.A. Scrosati 2015. Distant intertidal communities differing in species composition are similar in trophic structure. 44th Benthic Ecology Meeting (Quebec, QC, Canada). Ellrich, J.A., R.A. Scrosati & M. Molis 2015. Predator non-consumptive effects on prey recruitment weaken with prey density. Functional Ecology Meeting 2015, Alfred Wegener Institute of Polar and Marine Research, Haus der Wissenschaft (Bremen, Germany). Boudreau, M.L., M.C. Wong & R.A. Scrosati 2014. Can prey conspecific densities alleviate non-consumptive predator effects? A test with intertidal organisms. Atlantic Canada Coastal and Estuarine Science Society (ACCESS) annual congress (Halifax, NS, Canada). Wei, C.-L., M. Cusson, P. Archambault, P.V.R. Snelgrove, R. Belley, M. Bourque, B.J. Burd, K. Conley, R.A. Scrosati, J. Lemieux, M. Lévesque, H. Link, A. Piot, P.A. Ramey-Balci & A. Séguin 2014. Toward assessing Canada’s seafloor biodiversity: the Canadian Healthy Oceans Network’s (CHONe) Three Oceans of Benthic Biodiversity Database (TOBBS). 43rd Benthic Ecology Meeting (Jacksonville, FL, USA). Wetuschat, R., J. Houlahan & R.A. Scrosati 2013. Disentangling the effects of temperature mean and variability on species richness: a field study using tide pools. 11th International Ecological Congress (London, UK). Garbary, D.J., A.G. Miller & R.A. Scrosati 2013. Photosynthetic performance of the obligate epiphyte Vertebrata lanosa (Rhodophyta) when attached or detached from its host Ascophyllum nodosum (Phaeophyceae). 10th International Phycological Congress (Orlando, FL, USA). Keppel, E.A., R.A. Scrosati & S.C. Courtenay 2012. Effect of ocean acidification on American lobster. The American lobster in a changing ecosystem: a US-Canada science symposium (Portland, ME, USA). Ellrich, J., M. Molis & R.A. Scrosati 2012. Predator chemical cue effects on barnacle recruitment depend on nearshore pelagic food supply for prey. Atlantic Canada Coastal and Estuarine Science Society (ACCESS) annual congress (Halifax, NS, Canada). Musetta-Lambert, J., E.A. Keppel, R.A. Scrosati, P. MacDonald & S.C. Courtenay 2012. Rocky breakwaters as habitat for benthic intertidal biota: as good as natural rocky environments? Canadian Conference for Fisheries Research (CCFFR; Moncton, NB, Canada). Ellrich, J., M. Molis & R.A. Scrosati 2012. Predator chemical cue effects on barnacle recruitment depend on nearshore pelagic food supply for prey. Congress of the Canadian Society of Zoologists (Sackville, NB, Canada). Keppel, E.A., R.A. Scrosati & S.C. Courtenay 2012. Effects of ocean acidification and warming on lobster. 19th Congress of the Fishermen & Scientists Research Society (Truro, NS, Canada). Scrosati, R.A., J.C. Tam & S.W.B. Cole 2011. Environmental determinants of the regional distribution of NW Atlantic rocky intertidal invertebrates. 9th International Temperate Reefs Symposium (Plymouth, UK). Musetta-Lambert, J., E.A. Keppel, R.A. Scrosati, M. Skinner, P. MacDonald & S.C. Courtenay 2011. Rocky breakwaters do not offer the same quality of habitat for benthic intertidal biota as natural rocky environments. 9th Bay of Fundy Science Workshop (Saint John, NB, Canada). Keppel, E.A. & R.A. Scrosati 2011. Predicting the effects of ocean acidification and warming on lobsters. Atlantic Lobster Sustainability Foundation workshop (Moncton, NB, Canada). Ellrich, J., M. Molis & R.A. Scrosati 2011. Do snail predation risk and food supply interactively affect barnacle recruitment? - Keppel, E., R.A. Scrosati & S. Courtenay 2011. Effects of ocean acidification and warming on a mussel-seastar system. - Musetta-Lambert, J., S. Courtenay, R.A. Scrosati & E. Keppel 2011. Intertidal habitat ecology of breakwaters in the southern Gulf of St. Lawrence. Atlantic Canada Coastal and Estuarine Science Society (ACCESS) annual congress (Antigonish, NS, Canada). Keppel, E.A., R.A. Scrosati & S.C. Courtenay 2011. Current and future environmental determinants of intertidal and shallow-water benthic communities on the Northumberland Strait. - Ellrich, J. & R.A. Scrosati 2011. Are barnacle recruits attracted by barnacle adults? Fisheries and Oceans Canada, Northumberland Strait workshop (Moncton, NB, Canada). Lesniowski, T., E. El Belely, B. Nietsch, R.A. Scrosati, M. Wahl & M. Molis 2010. Stress‐modulated species interactions between macroalgae and mesoherbivores. 45th European Marine Biology Symposium (Edinburgh, UK). El Belely, E., R.A. Scrosati & M. Molis 2010. Resource-mediated environmental regulation of herbivore feeding capabilities: experimental evidence using rocky intertidal systems. III Congress of the Canadian Society for Ecology and Evolution (Quebec, QC, Canada). Watt, C.A. & R.A. Scrosati 2009. Effects of ecosystem engineers on community indices across environmental stress gradients. - Cole, S.W.B. & R.A. Scrosati 2009. Spatial scales of variability in abundance of dominant seaweeds and invertebrates from Gulf of St. Lawrence rocky shores. II Congress of the Canadian Society for Ecology and Evolution (Halifax, NS, Canada). Scrosati, R., B. van Genne & C. Watt 2008. Intertidal environmental stress gradients and seaweed canopies as determinants of species richness in trophic groups. I World Conference on Marine Biodiversity (Valencia, Spain). Scrosati, R.A. & S.W.B. Cole 2008. Marine ecological indicators from rocky intertidal habitats. Southern Gulf of St. Lawrence Research Network (Moncton, NB, Canada). Cole, S.W.B. & R.A. Scrosati 2008. Spatial scales of variability of intertidal invertebrates and seaweeds in the southern Gulf of St. Lawrence. - Tam, J.C. & R.A. Scrosati 2008. Testing the abundant centre hypothesis at local and regional scales using NW Atlantic intertidal mussels. American Society of Limnology and Oceanography (ASLO) meeting (St. John's, NL, Canada). Cole, S.W.B. & R.A. Scrosati 2008. Spatial scales of variability of intertidal invertebrates and seaweeds within the southern Gulf of St. Lawrence. - Longtin, C.M. & R.A. Scrosati 2008. The distribution of epiphytes across environmental stress gradients and factors limiting recruitment on hosts. - Tam, J.C. & R.A. Scrosati 2008. Testing the abundant centre hypothesis at local and regional scales using NW Atlantic intertidal mussels. I Congress of the Canadian Society for Ecology and Evolution (Vancouver, BC, Canada). Watt, C. & R.A. Scrosati 2008. Effects of benthic ecosystem engineers on intertidal species diversity. Atlantic Canada Coastal and Estuarine Science Society (ACCESS) annual congress (Halifax, NS, Canada). Cole, S.W.B. & R.A. Scrosati 2008. Spatial scales of variability of intertidal invertebrates and seaweeds within the southern Gulf of St. Lawrence. - Longtin, C.M. & R.A. Scrosati 2008. The distribution of epiphytes across environmental stress gradients and factors limiting recruitment on hosts. - Tam, J.C. & R.A. Scrosati 2008. Testing the abundant centre hypothesis at local and regional scales using NW Atlantic intertidal mussels. 37th Benthic Ecology Meeting (Providence, RI, USA). Scrosati, R. & C. Heaven 2007. Spatial trends in community diversity across rocky intertidal environmental gradients in Atlantic Canada. 42nd European Marine Biology Symposium (Kiel, Germany). Scrosati, R.A. & C.S. Heaven 2007. Community richness, diversity, and evenness across rocky intertidal environmental stress gradients in Atlantic Canada. Ecological Society of America congress (San José, CA, USA). Cole, S.W.B. & R. Scrosati 2007. Spatial scales of variability of macroalgae and invertebrates over the southern Gulf of St. Lawrence. Atlantic Canada Coastal and Estuarine Science Society (ACCESS) annual congress (Sydney, NS, Canada). Cole, S. & R. Scrosati 2007. Spatial scales of variability of macroalgae and invertebrates over the southern Gulf of St. Lawrence. - Eckersley, L., R. Scrosati & D. Garbary 2007. Testing environmental stress models of community organization using rocky intertidal habitats from Nova Scotia. - Longtin, C. & R. Scrosati 2007. Factors influencing the distribution of algal epiphytes (Vertebrata lanosa, Pilayella littoralis, and Elachista fucicola) on Ascophyllum nodosum. - Tam, J. & R. Scrosati 2007. Factors determining regional trends in mussel (Mytilus spp.) population structure and abundance across the NW Atlantic coast. Northeast Biology Graduate Student Conference (Halifax, NS, Canada). Heaven, C., L. Eckersley & R. Scrosati 2006. Rocky intertidal community structure across gradients of elevation, wave exposure, and ice scour in northern Nova Scotia. Northwest Atlantic Fisheries Organization Symposium (Dartmouth, NS, Canada). Scrosati, R. 2006. My contributions to marine ecology: Rob's academic impact multiplies. Marine Population and Community Ecology Symposium (Vancouver, BC, Canada). Scrosati, R., C. Heaven, L. Eckersley & H. Beltrami 2006. Marine environmental impact assessment: establishing baseline knowledge on rocky shore biological communities in northern Nova Scotia. Energy Research and Development Forum 2006 (Antigonish, NS, Canada). Scrosati, R. 2006. Ecology of marine rocky shores: seaweeds, invertebrates, and environment. 4th Workshop, Centre of Environmental and Molecular Algal Research (Sackville, NB, Canada). Heaven, C. & R. Scrosati 2006. Patterns in rocky intertidal community structure on the west and east coasts of northern Nova Scotia. - Eckersley, L., R. Scrosati & D. Garbary 2006. Assessing environmental stress and testing community organization models using rocky intertidal habitats from Nova Scotia. Northeast Biology Graduate Student Conference (Bar Harbor, ME, USA). Scrosati, R., C. Heaven & E. MacPherson 2005. Marine ecology lab: understanding the link between environment and life on marine rocky shores. Environmental Research Forum (Antigonish, NS, Canada). Mendoza-Carrión, G., R. Scrosati & N.Y. Hernández-Saavedra 2003. Genetic structure of Sargassum lapazeanum (Sargassaceae: Phaeophyta) based on RAPD analysis at regional, local, and intrapopulation scales. Marine Biotechnology Conference 2003 (Chiba, Japan). Ladah, L. & R. Scrosati 2002. Predicting the effects of El Niño on seaweeds from Baja California, Mexico. El Niño Symposium (Viña del Mar, Chile). Scrosati, R. 2001. Monitoring seaweed invasions: predicting the spatial variability of their population dynamics. Workshop on Marine Biological Invasions (Halifax, NS, Canada). Mendoza, G., N.Y. Hernández & R. Scrosati 2000. Optimization of DNA extraction from the seaweed Sargassum lapazeanum (Sargassaceae, Phaeophyta). 23rd Mexican Congress of Biochemistry (Acapulco, Mexico). Mendoza, G., R. Scrosati & N.Y. Hernández 2000. Estimation of potential dispersal patterns for Sargassum lapazeanum (Sargassaceae, Phaeophyta) from genetic structure at intrapopulational, local, and regional scales. 1st CIBNOR Congress of Biotechnology (La Paz, Baja California Sur, Mexico). Scrosati, R. 2000. Comparative ramet dynamics for clonal red seaweeds. 85th Congress of the Ecological Society of America (Snowbird, UT, USA). Rivera, M.G. & R. Scrosati 2000. Demography of fronds of Sargassum lapazeanum from southern Baja California, Mexico, during early stages. 54th Congress of the Phycological Society of America (San Diego, CA, USA). Scrosati, R. 1999. Demography of genets and ramets from populations of clonal red seaweeds: models and unanswered questions. - Scrosati, R., E. Servière, G. Mendoza & P. Cruz 1999. Ecology and genetics of seaweeds from Baja California: Pterocladiella (Rhodophyta) and Caulerpa (Chlorophyta). - Scrosati, R. 1999. Structure of a rocky intertidal community from the Pacific coast of Canada. 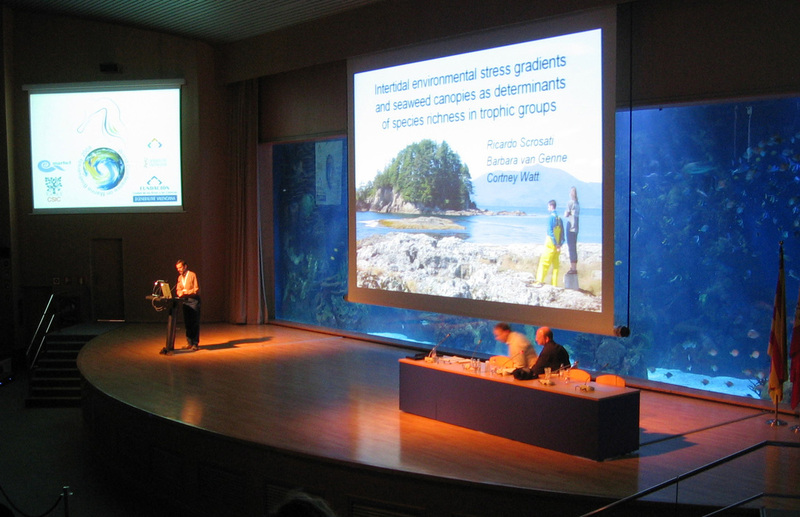 3rd Mexican Congress of Phycology (La Paz, Baja California Sur, Mexico). Scrosati, R., E. Servière, G. Mendoza & P. Cruz 1999. Ecology and genetics of seaweed populations from southern Baja California. 16th International Botanical Congress (St. Louis, MO, USA). Scrosati, R. & R.E. DeWreede 1998. The ratio between ecologically-similar gametophytes and tetrasporophytes in populations of the Gigartinaceae: demographic models. 52nd Congress of the Phycological Society of America (Flagstaff, AZ, USA). Scrosati, R. & R.E. DeWreede 1998. The significance of frond crowding for the survival of the clonal intertidal alga Mazzaella cornucopiae from Barkley Sound, Canada. ASLO (American Society of Limnology and Oceanography) and ESA (Ecological Society of America) Congress (St. Louis, MO, USA). Scrosati, R. 1996. Spurious correlation in data analysis. UBC Botany Department Symposium (Vancouver, British Columbia, Canada). Scrosati, R. 1994. The biomass-density relationship in clonal red algae. UBC Botany Department Symposium (Vancouver, BC, Canada). Scrosati, R., D. Garbary & J. McLachlan 1994. Reproductive ecology of clumps of Chondrus crispus (Rhodophyta, Gigartinales) from Nova Scotia, Canada. 8th Northwest Algal Symposium (Arcata, CA, USA). Scrosati, R.A. 1991. Anatomical studies on Desmarestia muelleri (Phaeophyceae) from central Chile. 4th International Phycological Congress (Durham, NC, USA). Scrosati, R.A. 1990. Morphology and anatomy of Desmarestia ligulata from Argentina and D. menziesii from Antarctica (Phaeophyceae). 2nd Latin-American Congress of Phycology (Lima, Peru).